Next Post What is your Christmas “spirit”? Chorizo exists in Spain. 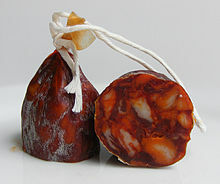 Its one of its finest products and very known in the world…but ¨Chorizo de Bilbao¨ its tru does its not exist. There is no such thing as “chorizo de bilbao”. Bilbao is in the north part of Spain, in the Basque country, and though they’ve got a lot of chorizos, not one is called “chorizo de bilbao”.